Nadine and Greg, a couple whose wedding I am planning, have decided to do a unique and original wishing tree as an alternative to a traditional guest book. What, you may ask, is a wishing tree? Wishing trees have their origin in Holland where wedding guests wrote their special wishes for the happy couple on leaves or pieces of paper and hung them on a tree. They can be casual and rustic or glittery and elegant. 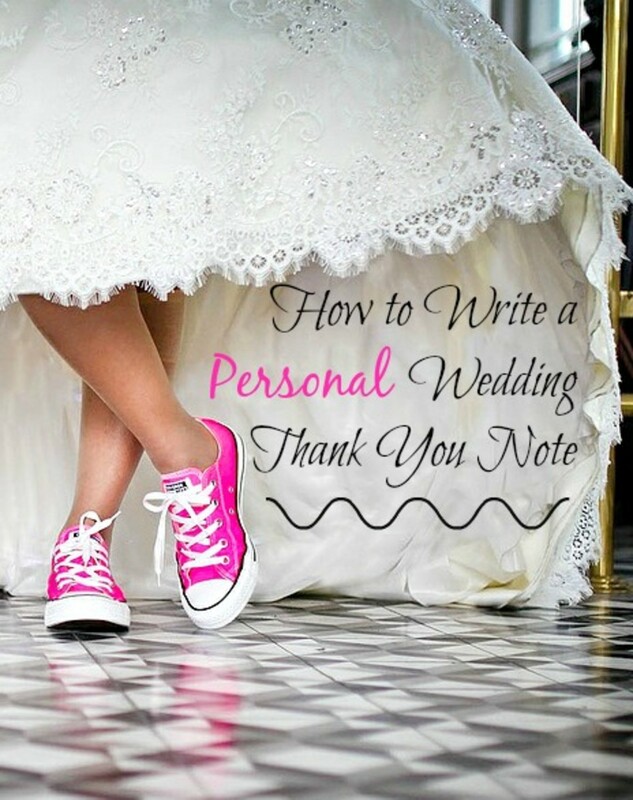 It's all up to you and the style you've selected for your wedding. I've included some gorgeous photos of the many different ways you can create your very own wishing tree for your wedding. Nadine and Greg have chosen as their wedding style very classic and elegant. Their wedding colors are red and white and their wedding flower is the rose. 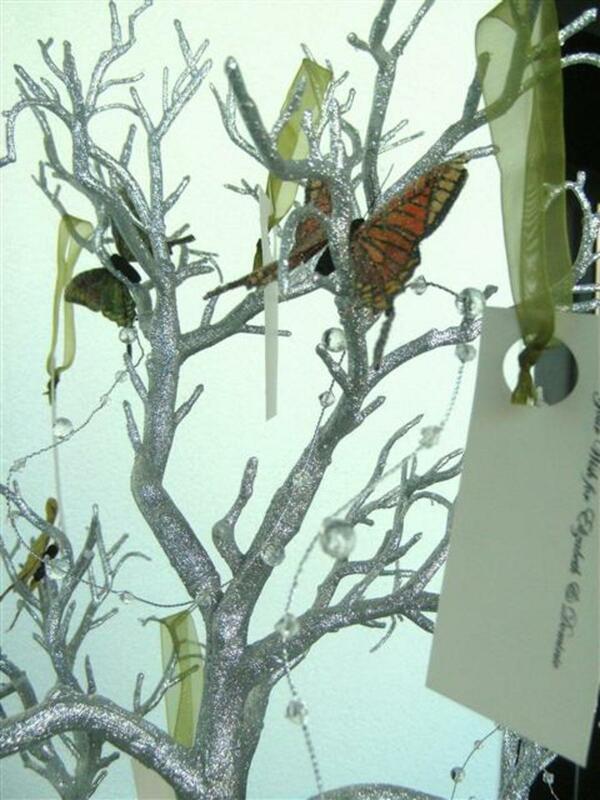 So I've decided to create a very formal and gorgeous wishing tree for them heavy on the "wow" factor! I researched manzanita branches which are what all the wedding sites recommend for wishing trees, because the branches are very strong and sturdy, but ouch! they are expensive! I've decided to search out some alternatives. I have dogwood trees in my yard, my neighbor has a magnolia, and I also have some mimosa which I recently cut down in my yard. (Never plant those things by the way; they'll spread like wildfire in your back yard! Not a good thing!) The key thing is making sure the branches don't bend under the weight of the wishing tree cards and the crystals I plan on hanging on them. The size of your wedding will determine the size of your tree. Nadine and Greg anticipate about 150 guests, so a tree like the one below, although pretty, is too casual and small for their wedding. I have gathered eight branches and have spray painted them silver. You could use any color you want to go with your theme, but I wanted them to look very formal It's amazing the transformation just from spray painting ugly old tree branches. I then gave them a good coat of spray glitter for extra sparkle. Gorgeous, these would be great for Christmas table décor! Anyway, I digress! Next, I dug through my sister's garage (she's not on the hoarders show yet, but she does have a lot of STUFF!) and found two identical vases. They are clear and the cut glass kind that will look very pretty when I surround them with votives. I weighted the vases down with some iridescent dollar tree gemstones. The stones come in numerous colors. You could do the same or use marbles or use the kind that look like smooth rocks for a more rustic look. You really need something heavy in the base of your containers or your trees will fall down...not a good thing to happen at your reception! 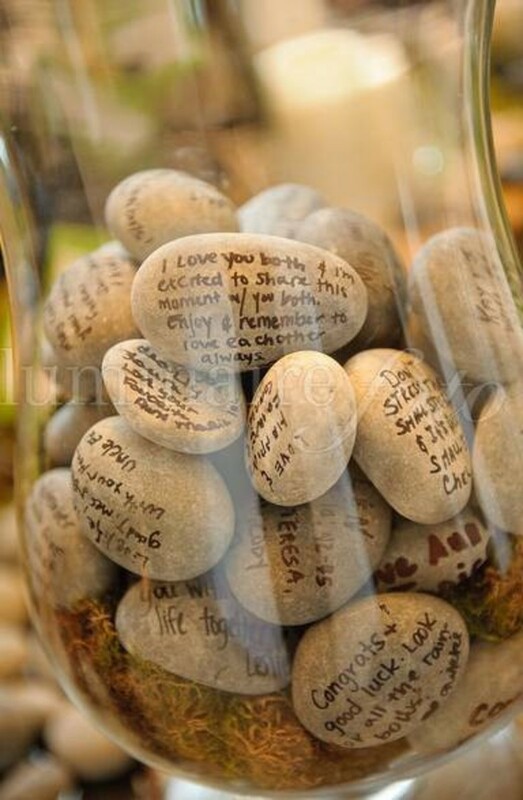 You don't have to completely fill the vases with the stones, although it might not be a bad idea, because you want something heavy to anchor the tree branches. You'll need to fill your vases at least 3/4 of the way full to help the branches stay where you've put them. Richland Manzanita Branches Sanded Sierra Natural Manzanita 18"- 26"
In some blogs, I've seen where they've used the same crystal bead strands that they hung on the tree to fill the vases. I wouldn't advise it unless you are using real glass or crystals, because they don't have enough weight to support your tree branches. I arranged the tree branches in the two vases among the stones. Already looking gorgeous! 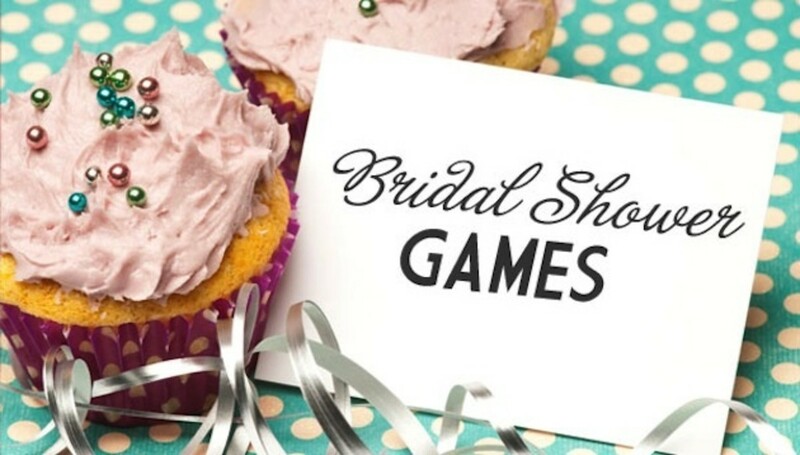 WARNING: You can play with this all you want at home beforehand (in fact, I'd advise it), but don't assemble until you are ready to decorate at the reception...much too hard to transport and all your careful arranging will be ruined! I had some leftover mirrored glass squares from a DIY project gone wrong in my daughter's room, so they came in handy for a beautiful focal point for the vases to sit. You can use circles or ovals, it's up to you how you want it to look. I ordered some loose crystalsfrom shopwildthings.com to scatter about on the mirrored glass as well as some loose rose petals. I also ordered the acrylic crystal strandsfrom shopwildthings as well. They come on a door curtain kind of thing that you simply cut the bead strands right off of and to whatever length you want. Oh c'mon, don't tell me you don't remember those things! (Mine was blue, I thought I was a super cool hippy chick back in the day!) The best part is they don't come apart when you cut them, but stay in one nice long strand, perfect for draping. The cards are nothing,but white cardstock cut in a 4" x 3" rectangle. 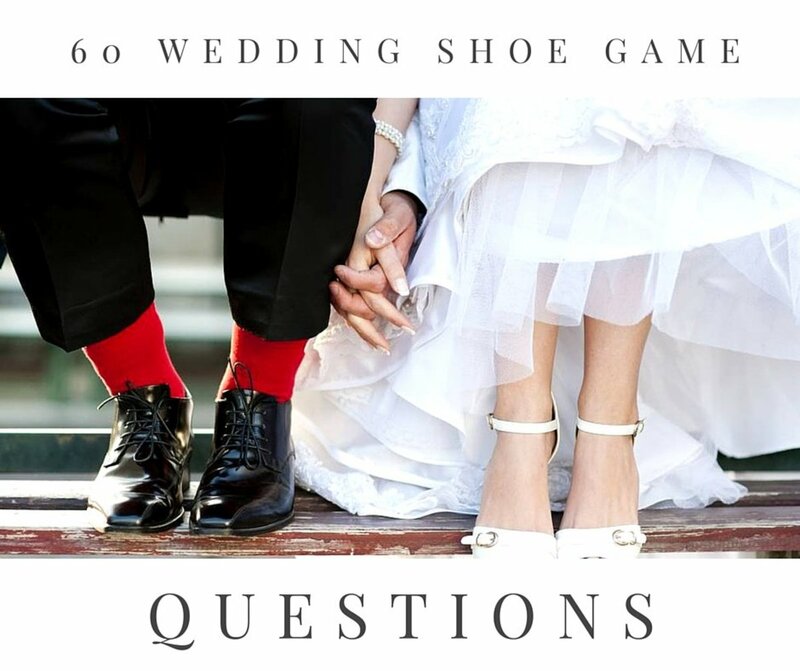 Because Nadine and Greg's colors were red & white, we chose to back the white cardstock with an ever so slightly larger piece of red cardstock, so there would be a pretty red border and it would really make the cards pop. Choosing how you want your cards to look is probably the hardest part. There are several free templates on the internet you can use. One of my favorites is one that says simply "Wishes." We chose to do the wording in silver and the font is Vivaldi in Word. You can choose to put a decorative border around your card or leave plain. One you have your cards printed, either at your local copy shop, or at home, you will need to punch the holes at the top for the ribbon to go through. 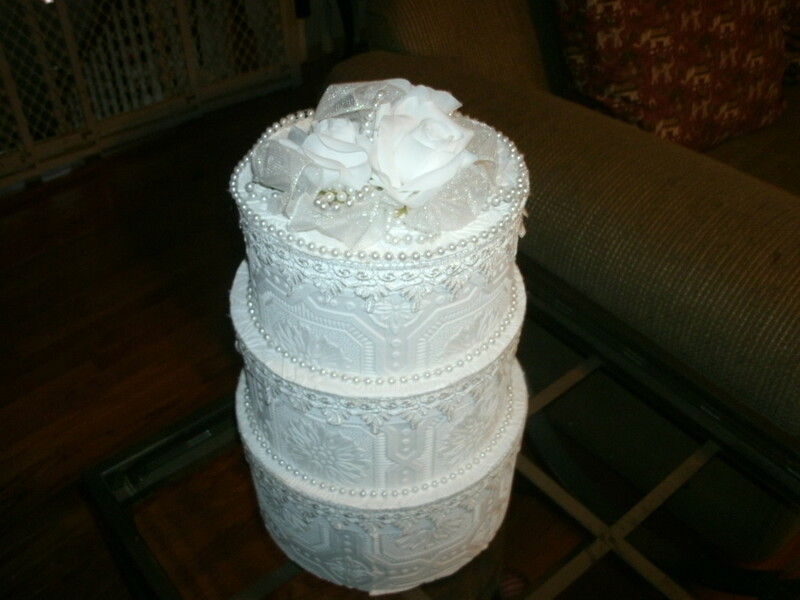 To avoid it looking too Valentine-y, we chose to use a sheer white 1/4" ribbon we bought on a roll at Wal-Mart. We made a lark's head knot through each hole and tied the ends together with a knot. You could do bows, but we thought that was a little too cutesy! The wishing cards will be arranged on some nickel-plated serving trays that we bought from, believe it or not! the dollar store! 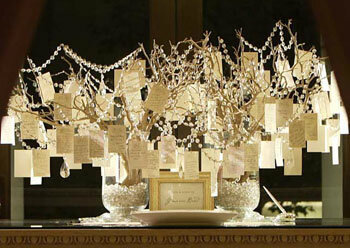 Then as guests come up to the table, they can pick up their card, write their wish, and hang the card on a the tree. 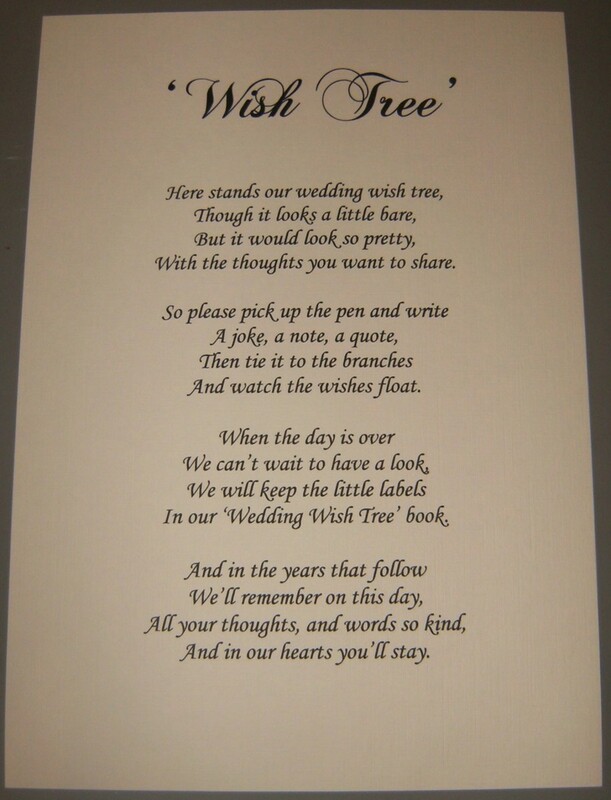 There are several different verses that you can use and print on pretty paper and put in a beautiful decorative frame to place in front of your tree to explain to guests the purpose of the tree and what they are supposed to do or you can simply put "Best Wishes for the Mr. and Mrs." and let them figure it out! I have enclosed some of the verses you can choose from in the links at the bottom of this page. But I think Nadine and Greg will use the one pictured in the gold frame in this picture...simple, but sweet. Nadine and Greg are lucky enough that their reception site has tons of little votives in all shapes and sizes we can place around the base of the trees intermingled with the crystal stones. If you're not so lucky, there are tons of sites out there that SELL votive holders in all shapes and sizes! The candlelight from the votives really makes the crystals shine and it looks awesome! 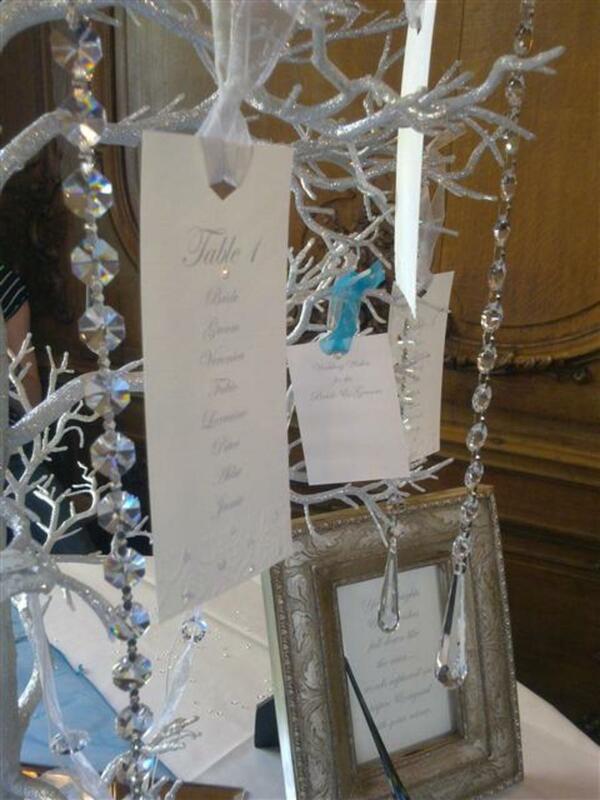 When you are at the reception site, you want to hang your crystal strands on the branches randomly until your tree looks fabulous! 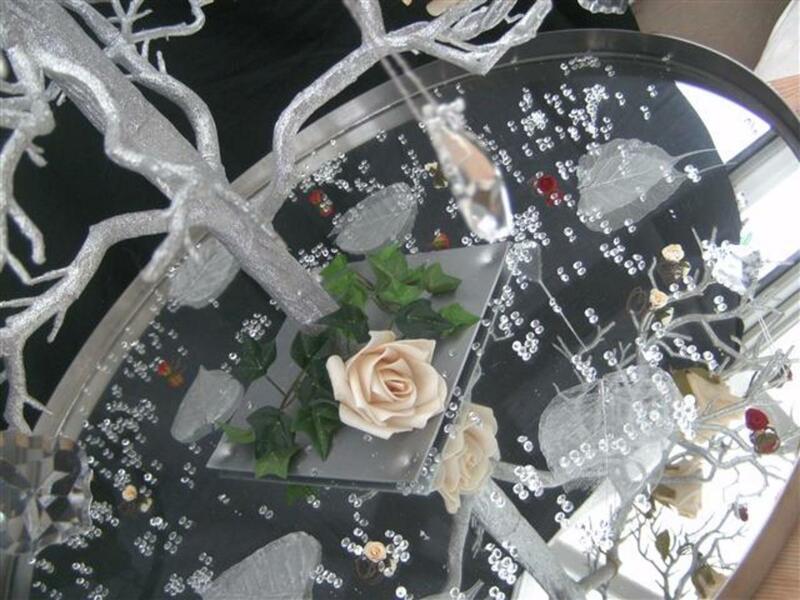 Once you have the crystal strands on the tree, you are pretty much ready other than lighting your votives and placing the wish cards on your silver trays. Make sure to order two pretty pen sets for the guests to write their wishes! 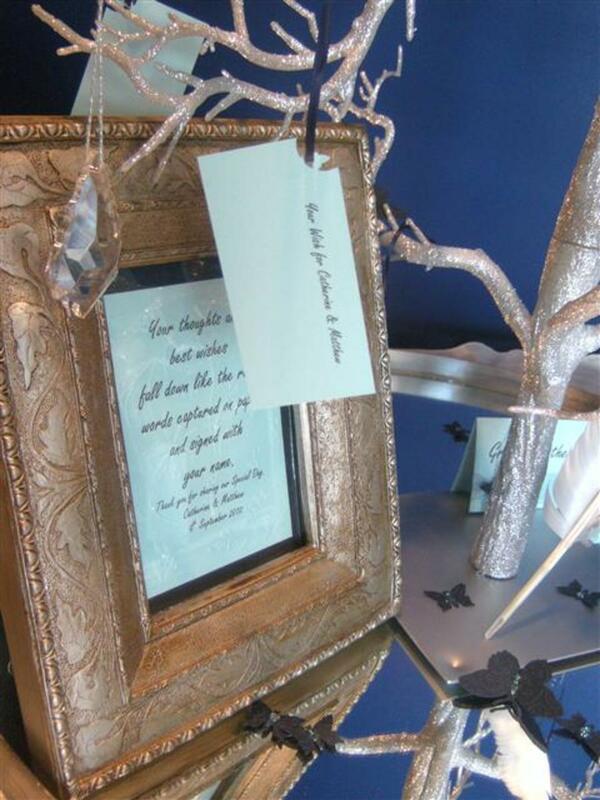 Place the verse you chose in a frame centered in front of your wishing tree (or in our case trees!) 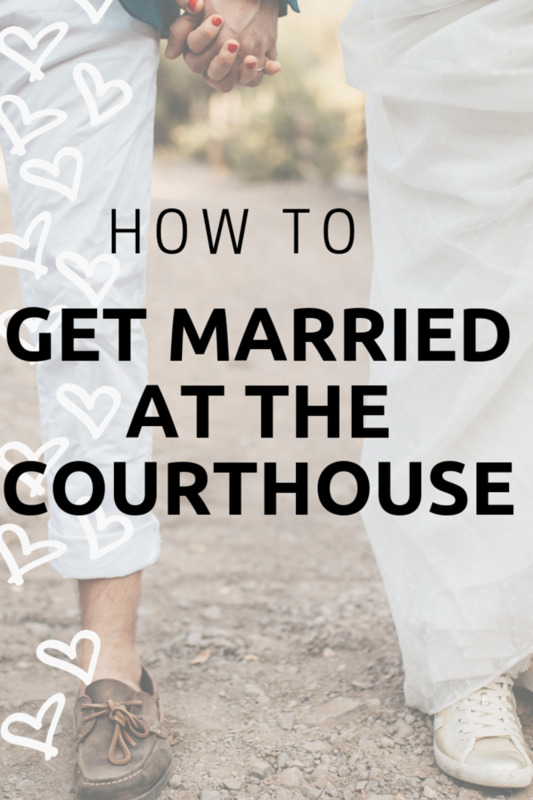 Make sure not to light your votives too early and have your planner check them often during the reception to make sure they haven't burned down completely. No sense having a fire at your reception being the highlight of your special day! Besides using these trees as an unconventional guest book, you could also use them to hang wedding favors on as pictured here or as table decorations with the table seating arrangement hanging on the cards. 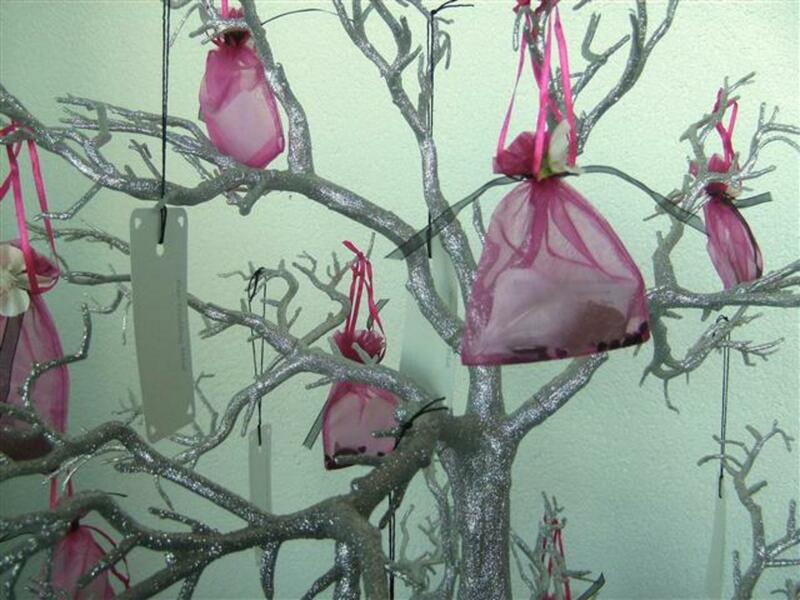 Regardless of how you use them, wishing trees are beautiful and a wonderful addition to your wedding!